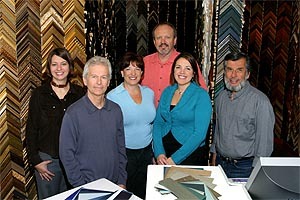 The friendly and accomplished Frame Works staff combines over 76 years of professional picture framing experience. We specialize in preservation framing of valuable documents, memorabilia, and artwork. Our staff has experience in printmaking, photography, ceramics, acrylic, oil, and watercolor painting and includes a Professional Picture Framers Association Certified Picture Framer. We are experienced in the framing of valuable and unusual historical pieces. Frame Works offers a comprehensive art consulting and framing service for Businesses in San Luis Obispo County. Whether you are a homeowner or interior designer, the home is your canvas and you are the artist. Frame Works will help you create a unique frame design that helps express your personality, style, creativity and good taste. We know that decorating your home is more than looking good, it is a celebration of who you are and how you live. We are a highly qualified Custom Picture Framer specializing in upper end framing and preservation of old documents, memorabilia, needlework, fine paper art as well as oil and acrylic paintings. We design and manufacture custom picture frames from hand wrapped silk mats with gold leaf frames to inexpensive metal poster frames. Our design staff is willing to take the time necessary to create framing that will enhance your art, demonstrate your good taste and work within your home or office environment. You will appreciate our sense of design, color and proportion. Because of our wide range of product we are able to design for any taste and pocketbook. We have over 5,000 frame molding choices, thousands of paper mat and fabric liners, 13 glazing options, and the expertise to recommend the appropriate framing solutions for your artwork. Using the finest equipment available, our staff's craftsmanship is unparalleled. Come in and experience our work. Our mat cuts are crisp and true, mat corners do not have over cuts or undercuts, frames are properly cut and joined, and we demonstrate our pride in each frame we build. Each project receives the personal attention and special care from our staff. We understand the value each piece holds for you, whether it be monetary or sentimental. We treat each item with the utmost respect. Please call us at 805.542.9000 or send us an email info@sloart.com. © 2017, Frame Works. All Rights Reserved.